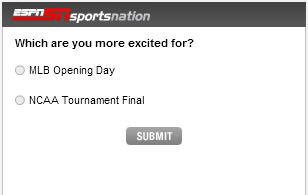 ESPN.com Poll - People Still Watch Baseball? You are kidding with that right? Isn't baseball basically on the level of hockey? Any day now, they'll announce a new partnership with that Versus (VS) network won't they? The only thing anyone in the sports world has been talking about for the last month is the NCAA Tourney, yet ESPN asks this question. Hmm...the Yankees and Red Sox fans at ESPN must be having a wonderful day.